High flexibility and efficiency – with only one truck, goods can be transported, lifted and handled in many different ways. Optimum utilization of the space – the Logiflex is of compact construction and is very maneuverable. High flexibility and efficiency – Logiflex with straddle legs transports, lifts and handles goods on all types of pallets – also closed pallets. Large range of optional extras ensures optimum flexibility. No damage to surroundings, pallets and goods. Logiflex has an elegant design with rounded corners. High flexibility and efficiency – the fully powered SELF Maxi can transport, handle and lift different goods. The design puts focus on the safety and ergonomic working conditions of the user – SELF Maxi can be adjusted to the individual user, and the ergonomic correct handle ensures the user a relaxed hold. No damage to surroundings, pallets and goods. SELF Maxi has an elegant design with rounded corners. High flexibility and efficiency – the fully powered straddle TPS Maxi and TSS Maxi can transport, lift and handle different goods. All types of pallets – also closed pallets – can be handled. Large range of optional extras ensures an optimum flexibility. The design puts focus on the safety and ergonomic working conditions of the user – TPS Maxi and TSS Maxi can be adjusted to the individual user, and the ergonomic correct handle ensures the user a relaxed hold. Fully powered Logiflex Mini – light, flexible and safe! 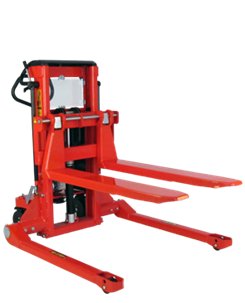 Logiflex Mini is a light and maneuverable fully powered stacker – your best choice for the light handling in minor storage and shopping areas. The design puts focus on the safety and ergonomic working conditions of the user. Logiflex Mini can be adjusted to the individual user, and the ergonomic correct handle ensures the user a relaxed hold. The low overall height gives optimum view conditions. No damage to surroundings, pallets and goods – Logiflex has an elegant design with rounded corners. Optimum hygiene – with the stainless-semi stacker the risk of bacterial contamination is minimized. The stainless-semi products are developed for environments where severe hygiene is needed on the surfaces that are in direct contact with the goods being handled, e.g. meat, fish or medicine.